This morning the 14 October, a local resident blocked the entrance gate to a Shell construction site for which there is no planning permission, refusing to move until some proof that Shell's actions are legal were provided. Local people noticed that Shell works were underway in Aughoose, Pullatomish this Monday 12 October (http://www.indymedia.ie/article/94428), despite the fact that Shell has not received planning permission for the onshore pipeline from An Bord Pleanála (which is due on or before 23 October). Today (14 October) a local resident blocked the entrance gate to the site with her car for two hours. A Shell tractor sat on the other side of the gate unable to move this whole time, with a handful of IRMS security standing around the tractor and filming the people who had gathered on the public road. The local person blocking the gate rang the Gardaí informing them that there is work going on without planning permission, and asked them to come investigate. They had not yet been informed by IRMS or Shell that work was being stopped. When Garda Conroy MY169 and MY288 arrived on the scene, they were only interested in facilitating the work. They did not address the person who had made the call to them, but went first to the IRMS Shell security on the other side of the gate. Immediately they ordered the driver to move her vehicle, without questioning the legality of the construction work. The site in Aughoose is where the proposed route of the pipeline crosses back over the estuary from Rossport South towards the refinery at Bellanaboy. It is Shell's privately owned land, but just like anyone else constructing on private land, they need to have planning permission. 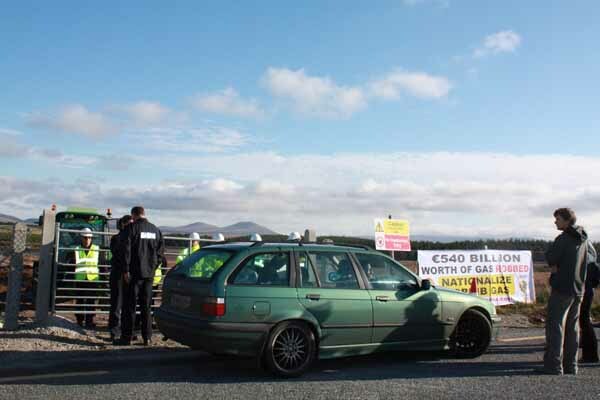 They have not yet received planning permission from An Bord Pleanála for the onshore pipeline, and there are no notices from Mayo County Council displayed at the site showing permission. They are drilling at the bottom of the field next to the estuary, with a small section of fencing encircling the drill. The only signs up on the fencing read 'Danger' and 'Construction Site' and the like. This is not clearly visible from the road at the top of the field. The guards then attached her car to the Garda car and began pushing people away from the driver's car. The Garda car started moving forward even though there were people on and in front of the car being towed. Only when Garda Noel Brett (in plainclothes) got his foot stuck under the tyre and a local person shouted at the Garda driving the vehicle to stop did the Garda car stop. The guards were able to tow the vehicle far enough for the gate to open and the Shell tractor to exit the field, then proceeded to park a Garda car in front of the gate (blocking a private entrance). Some further investigation (certainly not by An Garda Síochána) shows that Shell are in fact drilling on this private land, which drains into the adjacent Sruth Fhada Chonn estuary SAC and SPA (Special Area of Conservation & Special Protected area). Whether Shell's arrogance to start this work comes out of the assured knowledge that they will get the planning permission or as a way to test how far they can take it before any authorities question their actions is unknown. What is clear is that if Shell are not even waiting for planning permission, they won't wait long after it is granted to start pushing through the onshore pipeline without local consent.